Fearless Music have uploaded a third video of the set Streetlight Manifesto did for them, and this time the song is “Would You Be Impressed?”. Though not officially announced (with the exception of one show) on the Streetlight Manifesto website yet, several dates have recently appeared for a small Streetlight tour in America and Canada during late September and early October of this year. The support listed for these dates are Outernational and Broadway Calls, the latter of which have most of the dates on their MySpace. All the currently known dates can of course be found on the Streetlight Manifesto shows page, and hopefully Streetlight will post an update about the tour soon. Streetlight Manifesto have posted the dates for their upcoming South American tour on their website, though as of yet only one of them has a venue announced. The tour starts off with a show in Buenos Aires, Argentina before making four more stops in Brazil. The dates are of course also available on the Streetlight shows page. Victory published its latest product catalogue recently that revealed that the Everything Goes Numb vinyl is going to be a double LP instead of a single LP as originally stated, as well as the fact that, as suspected, the Victory web store will have an exclusive colour. Streetlight Manifesto have had to pull out of their show at the Ivory Blacks in Glasgow on 29th August for unknown reasons. Ticket refunds are available from the point of purchase. Fearless Music have posted the second of their Streetlight Manifesto videos to their YouTube channel, and this time it’s “Somewhere in the Between”. Streetlight Manifesto’s performance of “We Will Fall Together” from Fearless Music TV is now available on YouTube, and it’s a lot faster than the album version. In the update linking to the video Streetlight also say that their second song should be aired this weekend. The Fearless Music MySpace has a page detailing their airtimes and channels in different regions so you can check if you can watch/record it. Streetlight Manifesto have announced that they are going to tour South America for the first time in September of this year. The only confirmed country so far is Brazil, but there are apparently one or two more countries on the cards, details of which will be released in “the next few weeks”. After having their copy of their video for “We Will Fall Together” removed from YouTube a while ago for… peculiar reasons, Streetlight Manifesto have now uploaded it to hdfest.com, where it is streamable at a much better quality (even better than vimeo’s “HD” version). Additionally, it is also available for download, this time as a full 720p HD file. For some peculiar reason both the streaming and the download versions have a near minute long quiet opening shot of the moon instead of the usual few second it lasts, but it is otherwise great quality. 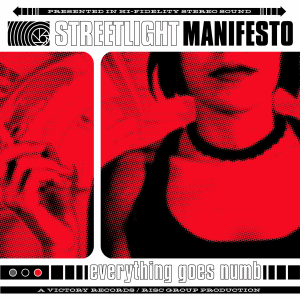 Victory Records are finally pressing Streetlight Manifesto’s Everything Goes Numb on vinyl, as revealed by Vinyl Collective yesterday. 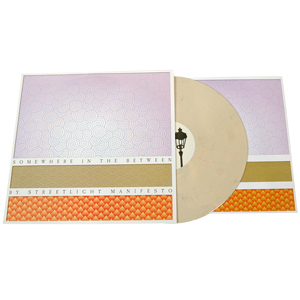 The standard press will be on red and Vinyl Collective have an exclusive white pressing which is out of 500. In addition they are running a competition giving everyone who buys a copy a chance to win a test press. It also seems likely that there will be a third pressing, perhaps exclusive to the Victory web store, as there was with Somewhere in the Between, with the obvious choice of colour being black as it is the third colour used for the artwork. The vinyl is expected to be released sometime in July, though given the delays the SitB pressings experienced it’s probably best not be too expectant. This is slightly old now but Streetlight Manifesto are confirmed to be playing both the Reading and Leeds festivals this year. They will be playing on the Lock Up stage, in Reading on the Friday (28th August) and in Leeds on the Sunday. They will also be playing a gig at the Glasgow Ivory Blacks on the intervening Saturday. Streetlight Manifesto have updated their site with the dates of the last few US headline shows they are doing before they embark on the Warped tour. In regards to the current, nearly over, European tour they explained that, due to a personal matter, trumpet player Matt Stewart had to return home, so they have been playing with a short-notice replacement and their song repertoire is, as a consequence, somewhat limited. As for 99 Songs, sit tight a tiny bit longer. The record is out of our hands now, in terms of recording, so we’re all waiting at this point. We’ll be posting a track list on the site very soon. The Streetlight Manifesto site was updated today with news that they will be wrapping up recording and mixing the first part of 99 Songs of Revolution within the next few weeks, and that it will be available (in some form) sometime before the Warped Tour starts. A track listing and additional release info should be forthcoming. In addition Streetlight found some time to record a performance and interview for Fearless TV, and promise to inform us of its air date, so hopefully someone will be able to record and upload it for those of us unable to watch it. The RISC Store is currently having an “economic stimulus sale”, where everything is reduced by 10%. The items are still listed at their normal prices and the discount is only applied after you add them to your cart. So head over there and pick up any CDs you don’t already have, or perhaps treat yourself to a nice print or a hoodie for the cold weather (unless you’re in the southern hemisphere, in which case you’ll probably just want a t-shirt). I apologise for all this being rather old news now but I’ve been busy/apathetic lately. Anyway Streetlight Manifesto are touring Europe again this March and April, including 4 countries yet to be graced by their musical prowess: Greece, Spain, Hungary, and Tomas’ homeland: the Czech Republic. The tour will finish with just two UK dates (seeing as they just gave us a full tour back in December). They will also be playing all the dates of the Warped tour this year, which runs from June until August. Apart from this however they will not be touring the US again this year, instead they intend to hole up to record some new music and plan for 2010. A few days ago Alternative Press posted an interview and acoustic set with Tomas Kalnoky. He talks about (among other things) his influences, being on Victory, the writing process, and the 99 Songs of Revolution project, as well as playing acoustic versions of “Somewhere in the Between”, “Forty Days” and “Dear Sergio”. You can listen to it on the AP site or download it from here. Another date as just been added to the end of the UK leg of the 4 Out of 7 in 3 Before 9 Tour. The show is at The Peel in Kingston upon Thames on 14th December and tickets are available from the promoter Banquet Records. Reel Big Fish recently announced a tour next year with support from Streetlight Manifesto, as well as One Pin Short and Tip the Van. This will be the sixth time Streetlight have supported Reel Big Fish, and the tour will be hitting the US followed by the UK, Europe and Russia. The tour kicks off at the House of Blues San Diego on 1st January 2009, and the US dates, running until 25th January, are on the shows page now. Well after months of delays the vinyl of Somewhere in the Between finally shipped last week and is available from various stores. There are 3 colours: the standard tan/695 (pictured), an orange/190 exclusive to the Victory Webstore, and a blue/? exclusive to Interpunk.com. The upcoming Streetlight Manifesto show at the Brickhouse, Phoenix, AZ on 17th October has been moved to the Venue of Scottsdale a couple of miles away, due to the Brickhouse closing down. All tickets for the Brickhouse will be accepted at the door and if you don’t have one yet SM have provided a link where they can be purchased. You are currently browsing the News archives.